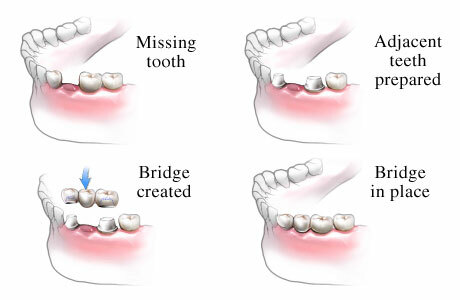 A bridge or fixed partial denture is a dental is a dental filling. Depending on the material it is used to restore the function of missing teeth by joining/making a bridge between adjacent teeth or other dental implants. A dental bridge is essentially a false tooth, called a Pontic that is permanently installed, so it’s fixed into place and cannot be removed.